When damage occurs at your home or business, personal property can be affected as well. While damage to a structure is measurable, the damage to your personal property in many cases is not. 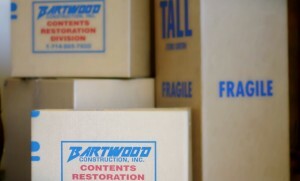 Your family heirlooms, fine collectibles, electronics and ALL of your personal property items are handled by our well-trained and professional crew members. Whether we are packing your items for storage, conducting an onsite cleaning, or if you are in need of a full contents restoration, Bartwood will handle your personal property items with the utmost care. To see our facility and learn more about our equipment…view our 3 minute tour here. As members of the Restoration Industry Association, our team is led by a Certified Restorer, Lori Young. (click here to see more about Lori) Under her direction, our experienced contents teams expertly handle all personal property and business property needs. Our state-of-the-art Cleaning Facility, including the Esporta ES-3300 (designed to clean mold, smoke and bacteria on soft contents), is equipped with all of the modern technology to clean and restore your property back to pre-loss condition.